A unanimous “go ahead” was recently given by the Central Archeological Council (CAC) for a project which when implemented will create a top new landmark on Delos. It concerns the architectural preliminary study for the partial restoration of the temple of Apollo–the main monument of the Delian sanctuary–carried out by the scientific personnel of the Ephorate of Antiquities of the Cyclades. “It is the first work to be done at the Sanctuary of Delos, and on no less than the temple of Apollo, the most important monument. Apollo’s temple will at last be recognizable on his island” said head of the Cyclades Ephorate and member of the CAC, Dimitris Athanasoulis to the Athens and Macedonia News Agency (AMNA). He added that the monument “consists only of its foundations today, but after the restoration one will be able to recognize the temple of Apollo in the sanctuary of Delos, which is very important. We are creating a top new landmark on the island”, he pointed out. The restoration includes, among other things, putting the bases of 11 columns in place, restoring a whole column lying on the ground at present with its capital, the placing of the drum of a column on the prostasis of the main temple’s vestibule and a sample of the entablature’s reconstruction. “This is the first phase, since there is a tremendous amount of material existing from the superstructure, the colonnades, entablature, epistyles and other places. In this phase we are going ahead with the first restoration which will not be complete, but quite satisfactory. The monument will acquire a third dimension which is also very important”, stressed Mr. Athanasoulis. The project which should start in the spring, once it is incorporated in the current NSRF, is not the only one being realized on Delos. “It is one of the NSRF’s smaller projects. The others include the restoration of the largest private residence of Dionysus where the nucleus of a museum will be created, the design of routes to the sanctuary, the conservation and better presentation of museum exhibitions in the museum” said Mr. Athanasoulis, adding that the project is part of a concept which “sees the ancient city as a city”. He ended by saying that “We have a holistic approach to Delos and each operation is incorporated into this general plan”. Delos is one of the most important archaeological sites in Greece and listed on the UNESCO catalogue, attracting a large number of visitors. It is undoubtedly one of the most fascinating ruins of the Mediterranean, since all the island is full of exceptionally well preserved buildings with unique mosaics, sculptures and movable finds that are kept in its museum. The Ephorate of Antiquities of the Cyclades has designed a programme of complete operations on Delos with the aim not only to preserve this valuable piece of heritage from the relentless damage inflicted by time in the extreme conditions of the Archipelagos, but also to make the sacred island a site which attracts visitors on a global scale. Some of these operations have been approved in principle as for example, the restoration of the ancient theatre, while others are already being realized, such as the restoration of the Stoa of Philip. These operations will contribute to limiting damage and also make the site easier for a visitor to understand. The temple of Apollo is situated in approximately the middle of the island’s west side, on the plain where the sanctuary of Apollo, Artemis and Leto evolved. It was built on a natural raised plateau 5m above sea level and is known from Delian inscriptions as the temple of Apollo and temple of Delians, the largest of the god’s three temples/residences (the temple of the Athenians, the Porinos Oikos), that is why it is referred to in bibliography as the Great Temple. 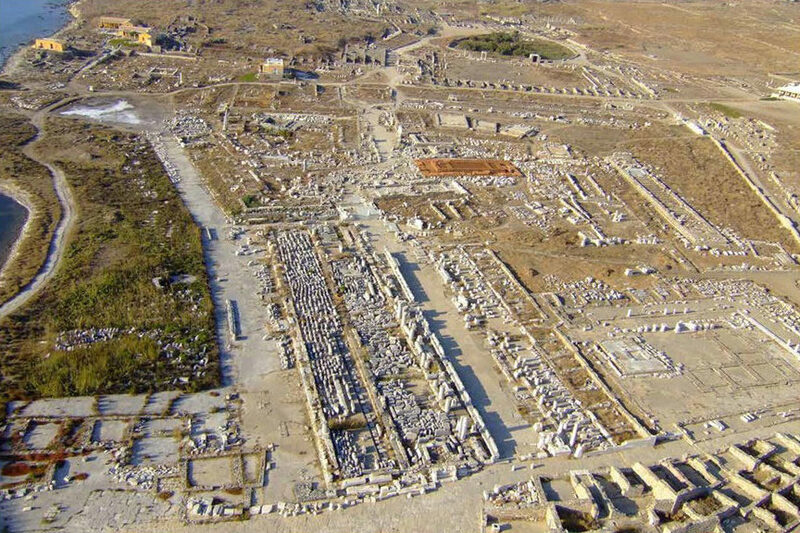 The temple’s construction generally coincides with the history of Delos. It was built in two phases: It began around 475-470 B.C. with funds from the Delian League and initially reached the height of the frieze. When the Alliance’s treasury was transferred to Athens in 454 BC, construction work was interrupted; the temple remained incomplete, probably with a rough roof, till the time of Delian independence (314 BC) when work started up again to be completed most probably in the early 3rd c. BC. What survives today of the temple of Apollo which was excavated in the late 19th c. and the beginning of the 20th, stands just above the foundations. According to specialists of the Ephorate of Antiquities of the Cyclades, the thought of restoring the monument automatically comes up because of the large number of surviving architectural members, combined with the site and its significance.